The first two came to me in investigating a classic joke (postings here and here), the third in some old Doonesbury cartoons that recently popped up in my comics feed. The Not Lady: Wife (NL:E) punchline to a formulaic joke; in its eventual canonical form, the joke is boiled down to a two-line exchange: A: Who was that lady I saw you last night? / B: That was no lady; that was my wife. The First Wife (W1) and Trophy Wife (TW) figures in a scenario of American popular culture, where the two wives are opposed to the Husband (H); in the scenario, after some years H abandons W1 for the younger, prettier TW. Lord Chesterfield’s Reproof. At the moment, I know of LCR as far back as a Little Rock AR newspaper story in 1830 (unearthed by Garson O’Toole and scanned in by Peter Reitan). That’s an American provincial source for a putative British court anecdote; it’s light on crucial details; and the attribution is to a major quote magnet, Lord Chesterfield (If you say or write lots of eminently quotable things, as LC did, then you’ll attract lots of others; consider Mark Twain, Oscar Wilde, and Winston Churchill.) So its origin story looks dubious. But as to its content. A gentleman points out a woman as being particularly ugly and LC, offended, says that the woman is his wife. An embarrassing faux pas, worth a small chuckle. And one gender-focused comment. We don’t find it remarkable that one gentleman would remark to another about the attractiveness of a woman — in fact, a lady, given the context — in a public setting; such a remark about a third gentleman in this setting wouldn’t be impossible, but (I think) much less likely than a remark about a woman. Peter Reitan tells me that the story was repeated in various forms for decades and was still in circulation when the NL:W punchline appeared. LCR isn’t much of a precursor of NL:W, however: it does convey ‘She is my wife’ but involves no denial. So the two are at best only loosely connected. Philip Dormer Stanhope, 4th Earl of Chesterfield, KG, PC (22 September 1694 – 24 March 1773) was a British statesman, man of letters, and wit. He was born in London to Philip Stanhope, 3rd Earl of Chesterfield, and Lady Elizabeth Savile, and known as Lord Stanhope until the death of his father, in 1726. Educated at Trinity Hall, Cambridge, he subsequently embarked on the Grand Tour of the Continent, to complete his education as a nobleman, by exposure to the cultural legacies of Classical antiquity and the Renaissance, and to become acquainted with his aristocratic counterparts and the polite society of Continental Europe. In the course of his post-graduate tour of Europe, the death of Queen Anne (r. 1702–14) and the accession of King George I (r. 1714–27) opened a political career for Stanhope, and he returned to England. In the British political spectrum he was a Whig and entered government service, as a courtier to the King, through the mentorship of his relative, James Stanhope, 1st Earl Stanhope, the King’s favourite minister, who procured his appointment as Lord of the Bedchamber to the Prince of Wales. … The social customs of the British nobility had left the Earl of Chesterfield without a legitimate heir to his lands and property. Hence, childless by his wife, Melusina von der Schulenburg, Countess of Walsingham (illegitimate daughter of King George I), Chesterfield acted to protect his hereditary interests by adopting his godson, Philip Stanhope (1755–1815), who also was his third-cousin, once removed, and the next heir to the title Earl of Chesterfield which he duly assumed as Philip Stanhope, 5th Earl of Chesterfield (1773–1815). … The impoverished widow of Chesterfield’s illegitimate son, Eugenia Stanhope, was the first to publish the book Letters to His Son on the Art of Becoming a Man of the World and a Gentleman (1774), which comprises a thirty-year correspondence in more than four hundred letters; begun in the 1737–38 period and continued until the death of his correspondent, Philip Stanhope, in 1768. I have tried without success to find a portrait of LC’s wife, Melusina von der Schulenburg, the Countess of Walsingham. Her mother — Melusine von der Schulenburg, Duchess of Kendal, mistress of King George I — yes, but his wife, no. Trophy wife is an informal term for a wife, usually young and attractive, who is regarded as a status symbol for the husband, who is often older or unattractive, but usually wealthy. … The term is normally used in a derogatory or disparaging way. … A trophy wife is usually a second or later marriage. The canonical first wife, W1, is a few years younger than her husband, H, attractive and accomplished but less accomplished than H (she must not be a threat to him, though ideally, she will come from a family of both symbolic and material substance). W1 is expected to further H’s career — by serving as hostess, working as an unpaid staff member for him, providing household income in the early stages of H’s career, and/or offering sage advice to H, but in any case giving emotional support to H in his career, and backing H up in all of his actions (up until the point where H abandons her in favor of a trophy wife), and of course managing all the affairs of domestic life. She is also expected to produce children (ideally, at least two, at least one of them, preferably the first, male), as soon as decently possible after the marriage; these children are crucial evidence of H’s virility. A canonical trophy wife (TW: W2 or later) has exactly one child with H; this child is evidence of H’s continued virility and of W’s (desirably feminine) fertility, without overburdening TW with childcare. noun trophy wife: informal, derogatory a young, attractive wife regarded as a status symbol for an older man. 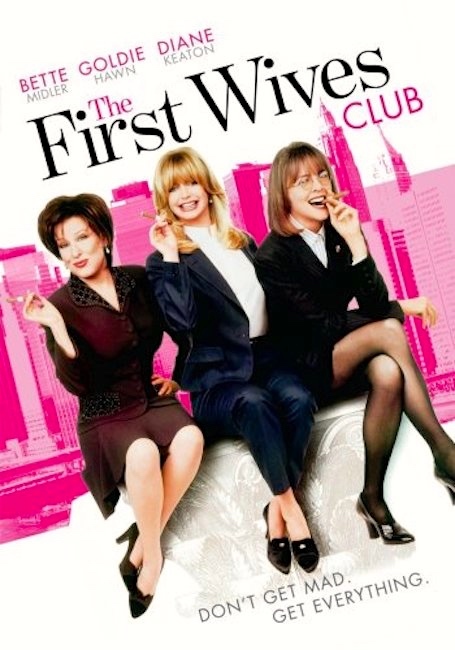 The First Wives Club is a 1996 American comedy film, based on the best-selling 1992 novel of the same name by Olivia Goldsmith. Narrated by Diane Keaton, it stars Keaton, Goldie Hawn, and Bette Midler as three divorced women who seek revenge on their ex-husbands who left them for younger women. Stephen Collins, Victor Garber and Dan Hedaya co-star as the husbands, and Sarah Jessica Parker, Marcia Gay Harden and Elizabeth Berkley as their lovers, with Maggie Smith, Bronson Pinchot and Stockard Channing also starring. … The film became a surprise box-office hit following its North American release, eventually grossing $181,490,000 worldwide, mostly from its domestic run, despite receiving mixed reviews. It developed a cult following particularly among middle-aged women, and the actresses’ highest-grossing project of the decade helped revitalize their careers in film and television. 45, born June 14, 1946, has five children by three marriages, and nine grandchildren. His first two marriages ended in widely publicized divorces. In 1977, 45 married W1, born February 20, 1949. They had three children: a son born in 1977 (note: the same year as the marriage), a daughter born in 1981, and a son born in 1984. The couple divorced in 1992 following 45’s affair with an actress. In October 1993, this actress, born October 27, 1963, gave birth to a daughter. She and 45 were married two months later. 45 and W2 were divorced in 1999. On January 22, 2005, 45 married another model, born April 26, 1970. In 2006, W3 gave birth to a son. The age offset of W over H is the difference between W’s and H’s birth years. 45 was born in 1946, W1 in 1949 (age offset of 3, entirely canonical), W2 in 1963 (age offset of 17), W3 in 1970 (age offset of 24). Canonically, TW is significantly younger than H – an age offset of roughly 10 or more. Both of 45’s TWs are canonical. In addition, age offsets in TWs should increase over time; in this, 45 is again canonical, with an age offset of 17 for W2, 24 for W3. The offspring index for W with H is the number of children has with H. Canonically, the offspring index for W1 is at least 2, while for a TW it’s 1; 45 – with offspring indices 3, 1, 1 — is again canonical. Yes, a stereotype, but one exemplified occasionally in real life. In fact, I have several male acquaintances who fit the stereotype pretty well. A: He [C] borrowed $500 from me and never paid it back. B: How is that worse than going after our [B’s and D’s] wives? A: Hey, I’ve seen your wives. It’s the Ugly Wife theme again. This entry was posted on September 22, 2017 at 7:01 pm and is filed under Formulaic language, Gender and sexuality, Jokes, Language and the sexes, Masculinity, Quotations. You can follow any responses to this entry through the RSS 2.0 feed. You can leave a response, or trackback from your own site.